We have already seen a number of videos and photos from the London set of The Fast and the Furious 6, featuring car stunts and explosions. 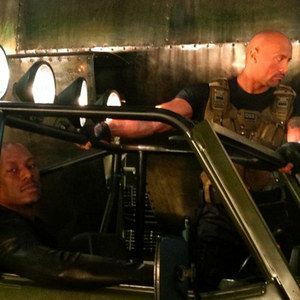 Today, MovieWeb favorite Tyrese Gibson posted two behind-the-scenes videos from the set, and a photo featuring the actor alongside Dwayne Johnson and Ludacris. The videos, shot by Tyrese himself, introduce us to a number of crew members, including a camera operator who slightly resembles actor Colin Farrell.